The post-translational maturation of GFP to the fluorescent form involves a number of steps. In the first step, the GFP apoprotein presumably must fold into a catalytically active conformation that facilitates the formation of the chromophore. The tripeptide Ser65-Tyr66-Gly67 appears to undergo cyclisation and oxidation to give a p-hydroxybenzylidene-imidazolidinone structure. The mature protein must then be correctly folded to maintain its fluorescent properties, presumably to protect the chromophore from solvent effects. The mature chromophore may exist in a protonated or unprotonated state, that appears to correspond to the two excitation maxima of the protein, at around 400 nm and 475 nm. The relative proportion of these two states of the chromophore can be affected by mutation (or extreme pH), and a basis for GFP variants with altered excitation excitation properties. One example is the widely used S65T mutant which is solely excited by blue light (475nm). Heim, Prasher & Tsien (PNAS 91, 12501-12504, 1994) were first to show that mutation of tyrosine-66, that forms part of the chromophore after maturation of GFP - can give rise to mutant proteins with altered fluorescent properties. In particular, the Y66H and Y66W mutations give rise to fluorescent proteins with both altered excitation and emission spectra. Chromophore mutations can be recombined with mutations that confer improved protein folding and thermotolerance, to improve the yield of these generally poorly fluorescent proteins. The fluorescence spectra for wild type (green), Y66H (blue) and Y66W (red) "GFP"s are shown (Kirby Siemering, Ralph Golbik, Richard Sever & Jim Haseloff, Current Biology 6:1653-1663, 1996). Prasher DC, Eckenrode VK, Ward WW, Prendergast FG, Cormier MJ: Primary structure of the Aequorea victoria green fluorescent protein. Gene 1992, 111:229-233. Cody CW, Prasher DC, Westler WM, Prendergast FG, Ward WW: Chemical structure of the hexapeptide chromophore of the Aequorea green fluorescent protein. Biochemistry 1993, 32:1212-1218. Heim R, Prasher DC, Tsien RY: Wavelength mutations and post-translational autoxidation of green fluorescent protein. Proc Natl Acad Sci USA 1994, 91:12501-12504. Siemering, K.R. Golbik, R., Sever, R. & Haseloff, J. Mutations that supress the thermosensitivity of green fluorescent protein. Current Biology 6:1653-1663, 1996. The I167T mutation produces altered spectral properties (Heim, Prasher & Tsien PNAS 91, 12501-12504, 1994). In combination with our V163A and S175G thermotolerant mutation, this produces a protein with dual excitation peaks of approximately equal intensity at 400nm and 475nm (solid blue line), and can be visualised well with either long wavelength UV (eg. hand-held lamp) or blue light (eg. argon laser). 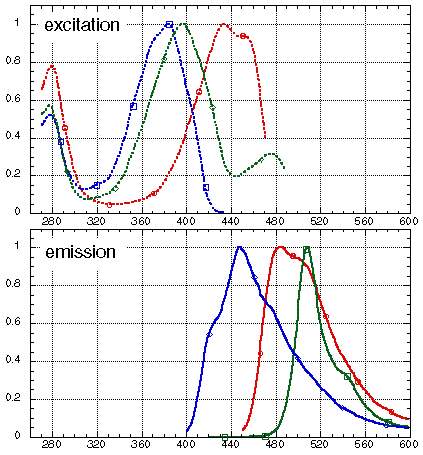 The excitation spectrum of wild-type GFP is also shown (dashed blue line). 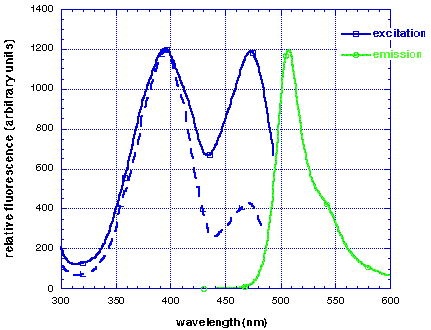 Both proteins have similar emission spectra (green line). 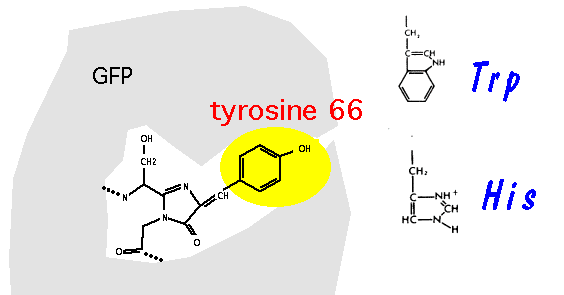 More radical spectral variants have been produced by substituting different amino-acid residues for tyrosine-66, that directly forms a portion of the chromophore after post-translational modification of the protein.For example, the Y66H mutation is blue fluorescent. Brighter GFP mutants were screened for in E. coli. One mutant (mGFPA) was isolated and shown to contain the mutant sequences V163A and S175G. A time course for the induction of wild-type (blue) and mutant (red) GFP fluorescence in E. coli at 37 degrees C is shown below. Mutations that supress the thermosensitivity of green fluorescent protein. (Kirby Siemering, Ralph Golbik, Richard Sever & Jim Haseloff, Current Biology 6:1653-1663, 1996). The substitutions present in GFPA cure the thermosensitivity of GFP expression in yeast. Strains of Saccharomyces cerevisiae MGLD-4a expressing either GFP or GFPA were incubated at 25°C and 37°C on synthetic drop-out agar lacking uracil. Colonies (each approximately 1.5 mm in diameter) were visualised on a Leitz DM-IL inverted fluorescence microscope, using a filter set (Leitz-D) suitable for the main 395nm excitation and 509nm emission peaks of GFP. The improper folding of proteins often results in their aggregation into insoluble inclusion bodies during expression in E. coli. To determine whether the proper folding of GFP might be temperature sensitive and whether the substitutions present in the thermotolerant mutant GFPA act by enhancing proper folding, we examined the solubilities of the two proteins during expression in E.coli at 25°C and 37°C. Bacterial cells expressing GFP or GFPA were grown overnight at either 25°C or 37°C, lysed, and the soluble and insoluble fractions separated by centrifugation. In each case, fluorescence was found almost exclusively in the soluble fraction. 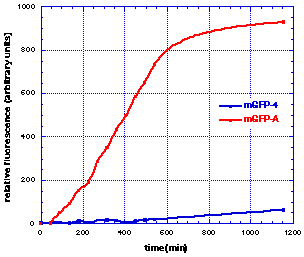 The amount of GFP or GFPA present in each fraction was then estimated by Western blot analysis. 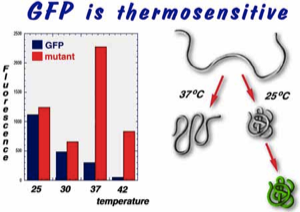 At 25°C, both GFP and GFPA were found predominantly in the soluble fraction, indicating that proper folding of both proteins is relatively efficient at this temperature. At 37°C, however, the majority of GFP was found as non-fluorescent protein in the insoluble fraction, whereas most of GFPA was still present in the soluble fraction. 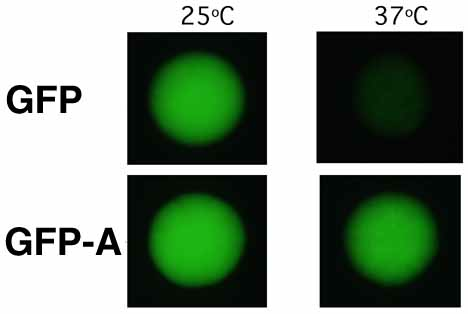 This result indicates that the temperature sensitivity of GFP maturation is due primarily to improper protein folding at higher temperatures, and that this defect is suppressed by the amino acid substitutions present in GFPA. Post-translational modification is required for formation of the mature fluorescent protein. We have shown that it is the mis-folded apoprotein species that accumulates at the higher temperature. * XL1-Blue cells containing pSE-GFP or pSE-GFPA were grown in 2xTY broth to an optical density of 0.2 at 600 nm and then induced overnight with 0.2 mM IPTG. Fluorescence was measured spectrophotometrically. @ Total protein prepared from the cell samples used for fluorescence measurements was subjected to western blot analysis (anti-GFP) and the amounts of intracellular recombinant protein determined by quantification of band intensities. Data have been normalised to the highest value that was obtained (7.8 x 10.5 arbitrary units for GFPA expressed at 37°C). The wild type jellyfish GFP is thermosensitive. Poor fluorescence of the protein at higher temperatures is due to misfolding of the apoprotein. A brighter fluorescent variant (V163A, S175G) that we have obtained from a screen in E. coli is thermotolerant, and shows markedly increased fluorescence (and improved solubility) at temperatures above 30 degrees C. Improved fluorescence has also been demonstrated in yeast and mammalian cells. The addition of a poly-histidine sequence to the terminus of GFP allows simple purification of the fluorescent protein, and related gene fusions. We've successfully used (His)6 residues fused to either N- or C- terminus. Synthesis of the protein is induced in E. coli, and harvested bacteria form pellets which are green coloured due to the high concentration of GFP. Binding of the tagged protein to nickel-NTA columns is efficient and can be directly monitored by fluorescence - bound GFP is usually visible in room light as a green band, and elution with imidazole-containing buffers can also be directly monitored. Use of a long wavelength UV lamp makes fraction collection extremely simple and fast. (Uwe Koehler loading the column). GFP is a very stable protein - is extremely resistant to proteases, and accumulates to high levels in bacteria. We routinely obtain high yields of purified GFP. The extracted protein is an attractive "day-glo" green colour in solution - under room light. When exposed to longwavelength UV light, the concentrated solutions (2-10 mg/ml) are intensely fluorescent.The tube pictured left is shown under room light (vis) and longwavelength UV light (uv).